At this time of year I start to be rather unenthusiastic about one particular crop, namely kale. It’s a great thing to grow – it provides fresh greens all through the winter from just a few plants and, when freshly picked, it is tender and delicious. But, it goes on for months and so eventually the novelty does wear off. Yesterday, however, I was inspired. I had made bread rolls and had defrosted some of the delicious pulled pork that I cooked for the winter solstice; I picked winter salad leaves from the garden, made mayonnaise using eggs from the hens and opened a jar of sweet chilli sauce made from our home-grown chillies. However, I really wanted a bit of crunch. And then it dawned on me: kale-slaw. I shredded some kale (including some of the thinner stalks, grated a carrot, chopped the top of a sprouting onion and with the addition of some of the freshly made mayo – a tasty slaw. I’m not sure how Jen Gale came up with the idea of “Mend-It May”, but during the past month, she has been encouraging folks to indulge in some repairs and share them via various forms of social media. I have, in recent years, been trying to get into the habit of mending more, and so this month was not particularly special for me. However, I like documenting my mends if, for no other reason, than to provide a record I can look back on and feel smug about. Some of the mends were made with sock wool and some with darning wool – it will be interesting to see which yarn holds up best. The pink/purple stripy socks were one of the first pairs that I knitted; they were originally intended to be for me, but I made them too big so Mr Snail got them. This is their third mend – they had their toes replaced once and they have been darned once before this time… eventually they may comprise more repair than original. Because I have been trying to keep on top of repairs I only have a few more to mention. The first was more of a resurrection than a repair and involved some home-made mayonnaise. When we got the chickens, I stopped buying mayonnaise and started making my own. If you look at the ingredients in commercial mayo and compare them with home-made (egg yolk, oil, seasonings, a little vinegar) you will understand why. It’s relatively easy to make, but you have to be patient and it can be temperamental… as was my last batch. As I gradually added the oil to the egg yolk, it started to thicken up nicely. Addition of a little cider vinegar, however, destroyed the consistency and I ended up with what looked like scrambled egg in oil – yuk! An odd, but very satisfying ‘mend’ that one. The other two mends I want to share are not mine, but both involve items that belong to me. A few months ago, I discovered that the pouring handle on my jam pan had come adrift on one side. I contacted the manufacturer via Twitter and they told me to email their customer services. I did this and simply received no response. I was busy and didn’t pursue it, but I did ask my friend. Alfred “Maker of Things”, whether he thought it was possible to fix it. He said things about ‘brazing’ which were clearly beyond me. However, Alfred came over to west Wales on holiday last week… and brought the equipment necessary to mend my pan. In fact, he effected the mend during the course of a tea party that we were both at. I still need to give it a good polish with wire wool, but otherwise it’s mended. Thank you Alfred. Not a bad set of things that we’ve extended the lives of… and I’m even coming to terms with darning! I use my Kenwood Chef with the balloon whisk attachment. Make sure all your ingredients are at room temperature. Once combined add vinegar to thin it to the desired consistency. With commercial vinegar a teaspoon might be enough, with homemade you might need a tablespoon or more. Store in the fridge in an air-tight jar. You can make it by hand, but it is a slow business and you need to be really patient and add the oil a drop or two at a time until quite a lot of it is combined. I don’t see any reason you can’t use duck eggs instead of hens eggs. Wherever they come from, though, remember that mayonnaise is not cooked, so you will be eating raw egg. 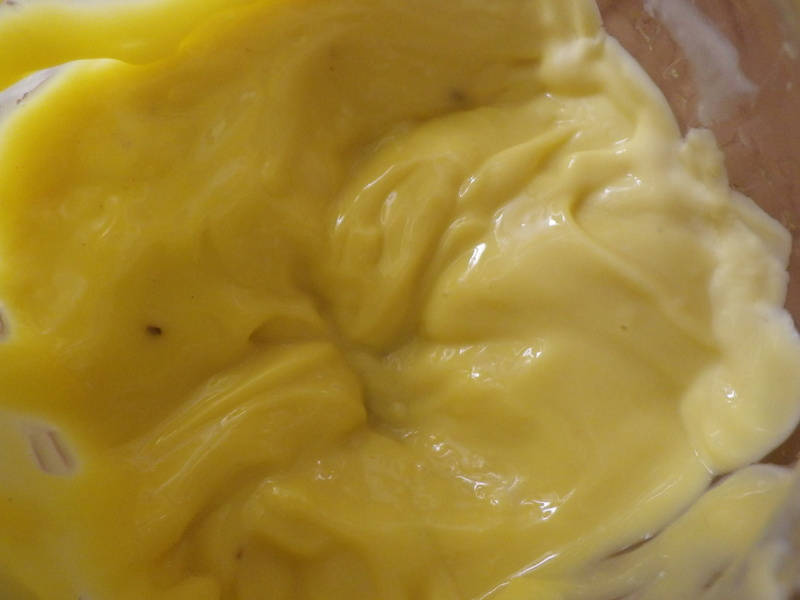 If you haven’t made your own mayonnaise before, you might be surprised how yellow it is and how rich. As you can see from the recipe, I use half olive oil and this comes shining through in the flavour, so choose oils you like the taste of and play around with the relative amounts of different oils. 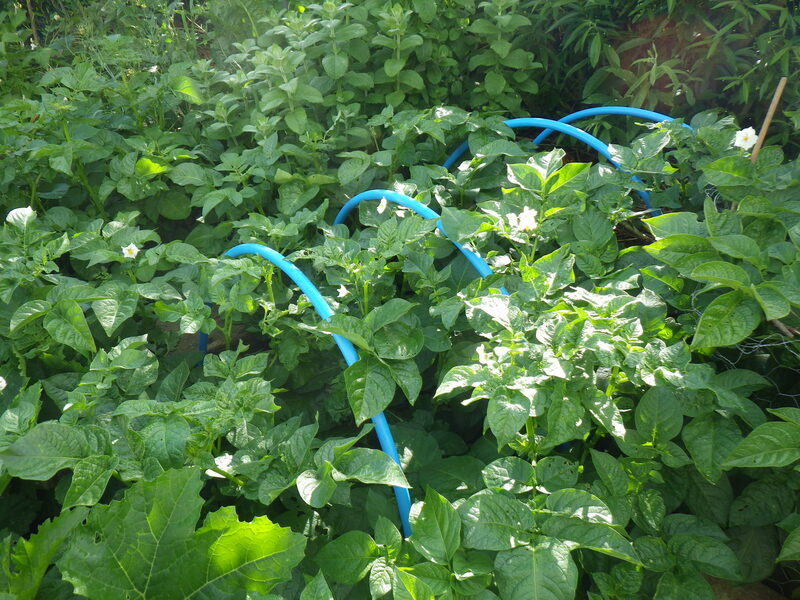 I have discovered that there are a number of things that I can grow really well in my garden: lettuce, potatoes and courgettes amongst them. Tomatoes I don’t seem to be able to have much success with, but I’m a dab hand with peppers. Of course I do grow other crops and this year it looks like parsnips and shallots are going to be a roaring success, plus the runner beans are doing well, not to mention the raspberries. But so far, what we have mostly been eating is lettuce. I have delayed harvesting potatoes in order to maximise yield and because lovely local Pembrokeshire new potatoes have been readily available, but once the last kilo in the cupboard is eaten up, our own harvest will commence. 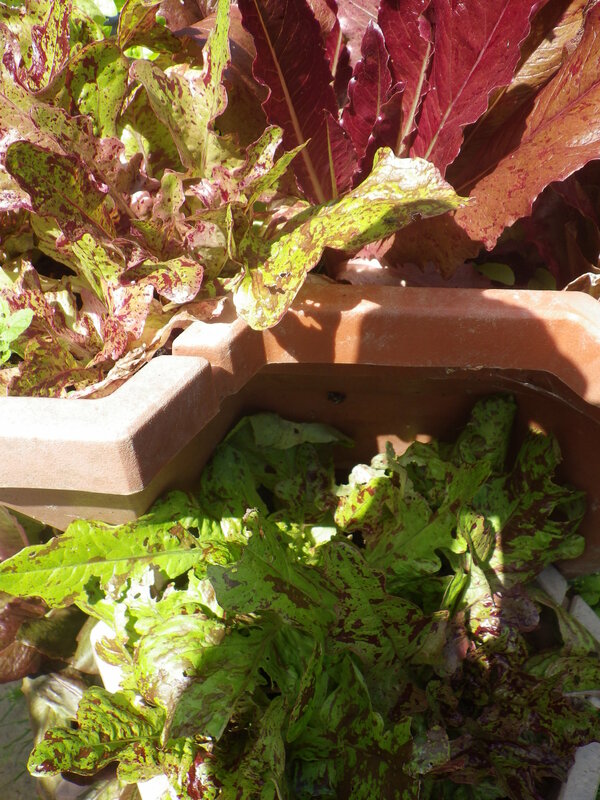 This year I have grown three varieties of lettuce: Flashy butter oak (a firm favourite from the Real Seed people), Forellenschluss (which means ‘speckled trout’; these seeds came all the way from Australia) and Red deer tongue (which may become my all-time favourite as it’s prolific and so crunchy). To add variety, we also eat blood-veined sorrel (a perennial) and various brassicas (there’s a nice self-seeded mustard currently doing well and adding a kick to our salads). I’m really not keen on supermarket lettuce out of a bag, but ours is always fresh from the garden – no packaging, no food miles and no chemicals. Anyway, tonight things are going to change as the ‘great courgette harvest’ begins… perhaps served with potatoes…?